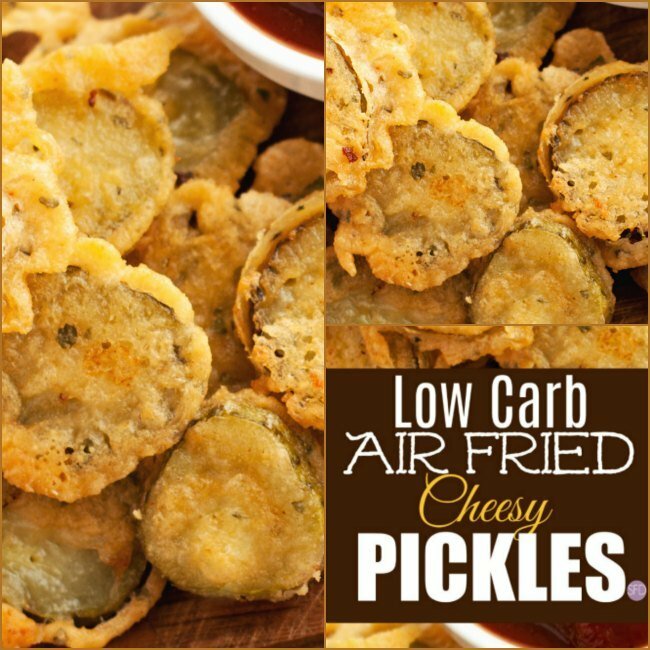 These Low Carb Air Fried Cheesy Pickles are just one more thing that I love about my air fryer. Not to mention that I am a big time pickle eater. Two of my favorite foods are pickles and cheese. Add those two foods to my new favorite kitchen appliance and this is what you get. 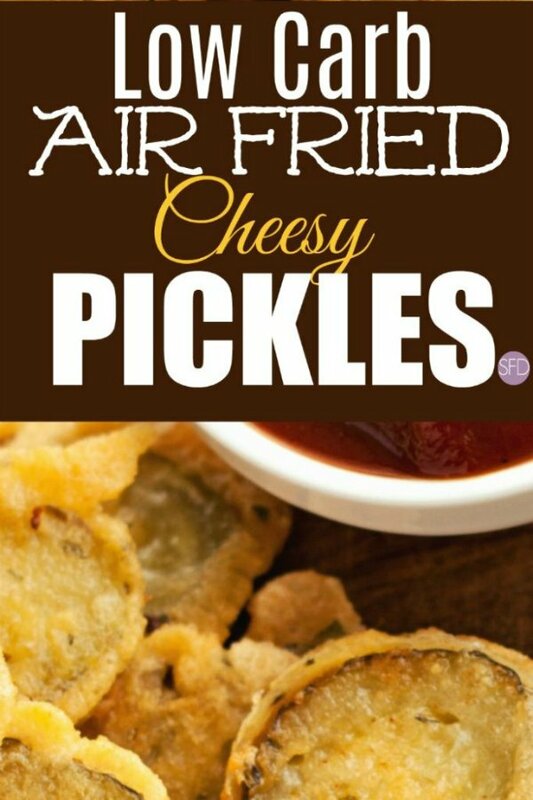 Sure you could make air fried pickles and cut out out the whole oil in the fryer thing. However, I choose to air fry because I do not want to have to deal with the whole oil fryer thing. To be honest, oil frying is the last thing that I need to have in my diet. Discovering the air fryer has been a great thing to happen in my kitchen. We are taking an average fried pickle recipe and making it even better. I must disclose that I am in the midst of a low carb diet (yet again…) so I tend to look at things a bit different from many folks. As a result, too ‘fry’ something we will use low carb ingredients rather than the usual breading ingredients that you would find in most fried goodies. To start with, you will need an air fryer. 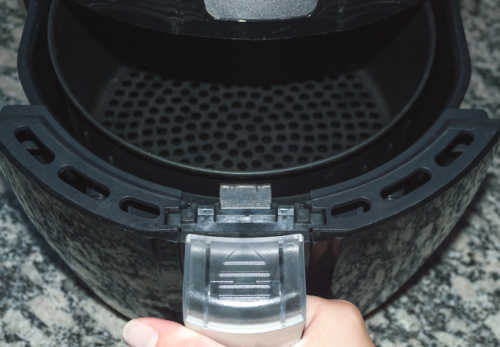 While I do not specifically endorse any air fryer over another, I would suggest reading the reviews to make your decision on which air fryer best meets tour needs. The good news is that you can find a decent one online at a good price. You will also need low carb bread crumbs. 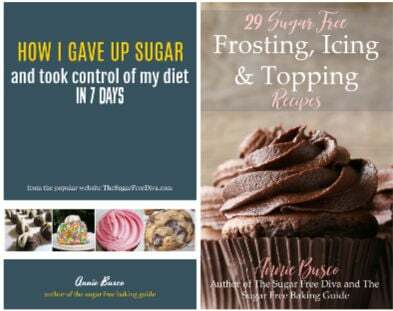 You can find low carb bread crumbs online. However, if you are not a low carb person, you can also just get away with regular bread crumbs. You will also need pickles for this recipe. As long as your pickles are in slices, you should be okay. As a pickle advocate… I like to use the big fat Kosher deli kind of pickle that I can slice up. Obviously, these pickles can be hard to find so feel free to improvise keeping in mind that for slices, larger pickles work best. Also, for the cheese, Parmesan is best however, you can use a Parmesan Romano or similar blend as well. 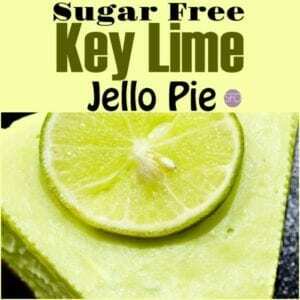 Here are some similar recipes that you may like as well. Dill Pickles- the large Kosher kind are preferred. Sliced into 1/4″ slices. About 2 cups sliced total. Egg- 1 whisked with a teaspoon of water. 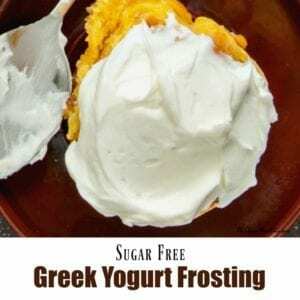 Low Carb Bread Crumbs- 1 cup. Can use regular bread crumbs instead if desired. I prefer my crumbs well grounded rather than large. Grated Cheese- 1/2 cup Parmesan or Parmesan Romano Blend. 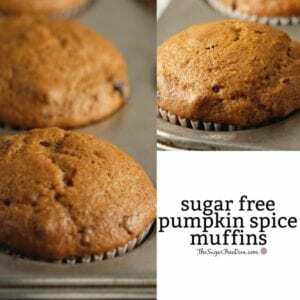 Preheat your air fryer to 400. I like to spray nonstick on my basket as well. Place your sliced pickles on paper towels to allow them to dry out while your prepare. We would like to get as much liquid as possible out of the pickles. You will need three bowls that are shallow and can be used for ‘dredging’. In the first bowl place your whisked egg and water. In the second bowl place your bread crumbs. And in the third bowl you can place your crumbs. If adding additional seasonings, add those to the bread crumbs. Use a fork to drag each pickle slice first through the egg bowl, then through the bread crumbs, and then finally through the cheese bowl. Once your pickle slice is well covered you can place it in the fryer basket. When you basket becomes full in a single layer of pickle slices, bake them for 4 minutes, flip them over, and continue to bake fro 4-5 minutes until crisp. You may not be able to bake all slices at once if you run out of room to lay them flat without overlapping. If you do overlap the slices, your pickles may not become bake evenly and thus, crisp up. A low carb recipe for cheesy air fried pickles. Dill Pickles- the large Kosher kind are preferred. Sliced into 1/4" slices. About 2 cups sliced total. You will need three bowls that are shallow and can be used for 'dredging'. In the first bowl place your whisked egg and water.